Just about every house has at least one spot that seems to defy doing anything useful with it. The shape is awkward, but it is necessary to the integrity of the home. Not being able to put that "dead space" to good use can be frustrating, especially if space is premium in your home. A number of furniture manufacturers have taken on the challenge of turning the dead space of homes into useful spaces. Not everyone can afford to buy an expensive piece of furniture or to order custom-built items, though. For those people, DIY projects become the solution. Seeing what can be done with a space and trying to figure out how it can be accomplished without hiring or paying someone else to do it is how each problem is tackled. 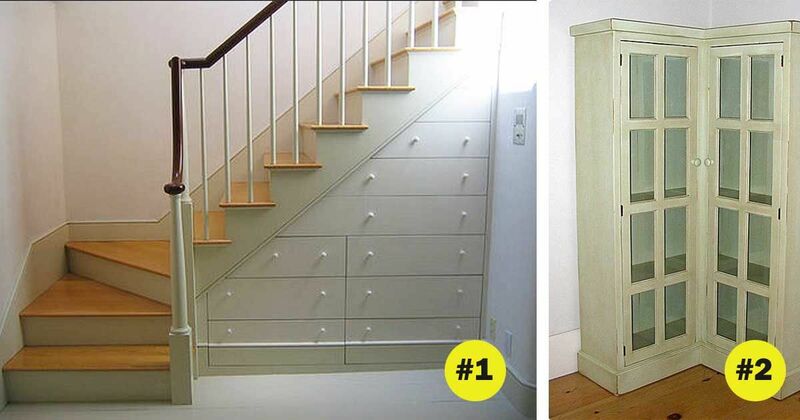 Below are seven great ideas on how turn dead space in homes into usable space. 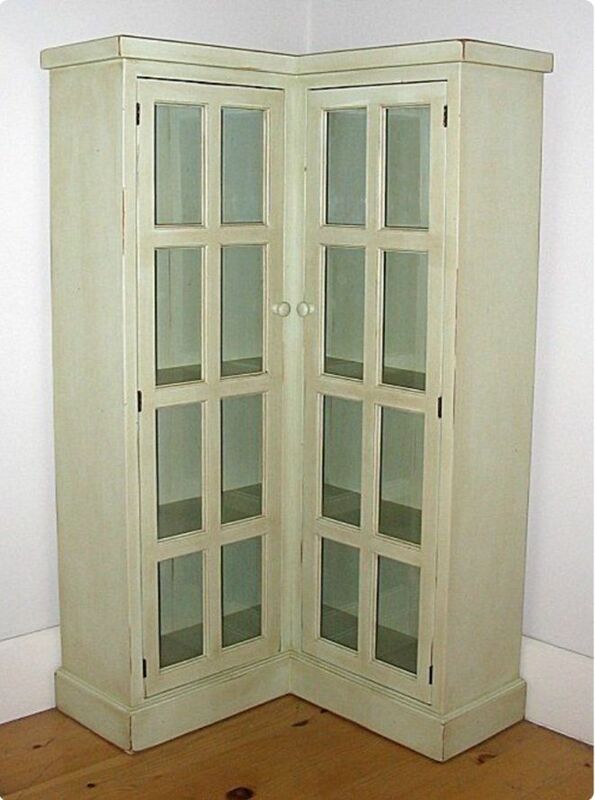 For open spaces in a corner of a room, Rosenberry Rooms has this handy corner cabinet. 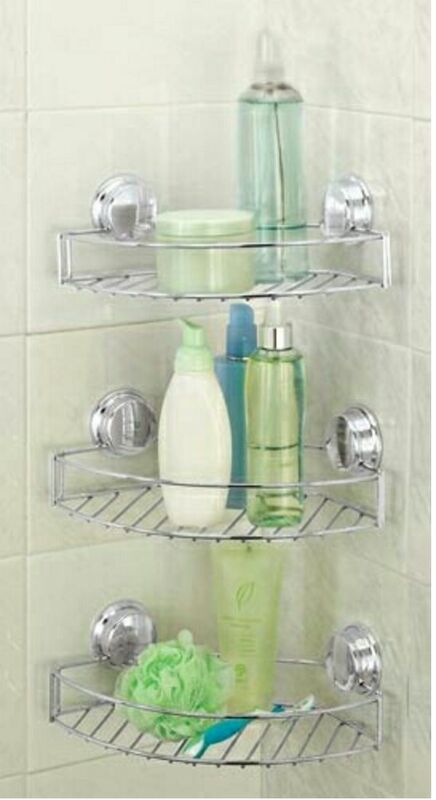 It keeps the spot neat and organized while giving extra vertical storage. The glass doors on the cabinet make this a great place to display collections that would not normally have any place to go, and the flat top can be used to place plants or other decorative pieces. 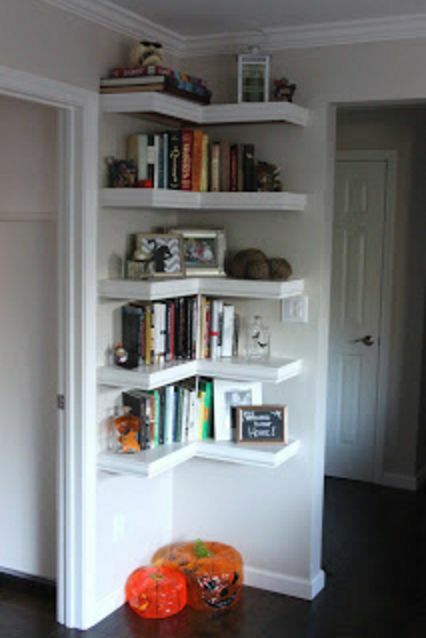 For those who are handy, rather than buying a cabinet, building corner shelves might be an option. Simply mark off the desired heights and install the shelves. Some molding can be added to hide the screws that attach the shelves to the walls. 3. 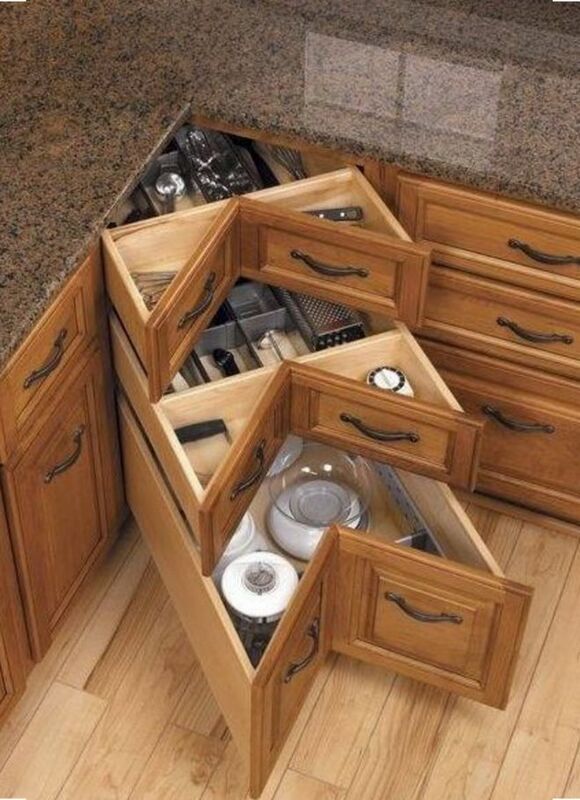 No more dead space with these ingenious kitchen drawers seen on A Thrifty Mom. A Thrifty Mom took what would normally be hard-to-reach storage in the corner of the cabinets and had the drawers below installed instead. The space is useful for storage and easy to reach all at the same time. 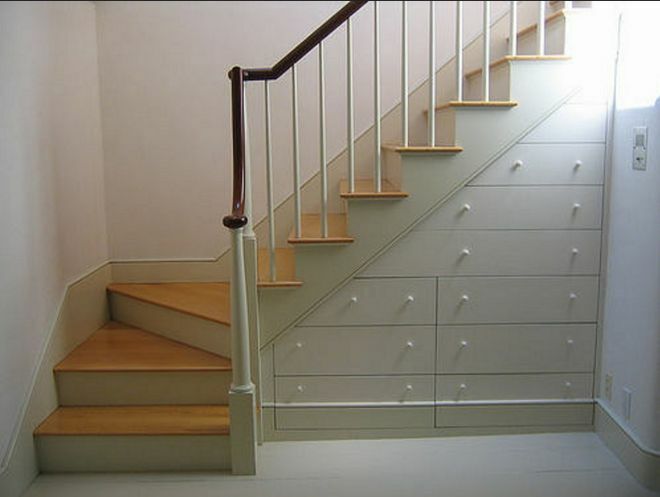 Rather than leave the area under the stairs empty and useless, CTD 2005 built some custom drawers under the stairs for extra storage. 5. Corner storage for the shower seen on Solutions. Having enough space for shampoo, conditioner and soap in the shower is always a challenge. Placing corner shelves at various heights maximizes what is generally unusable space and solves the problem of where to put all the cleansers. 6. Ikea corner cabinets for the kitchen seen on Involving Color. 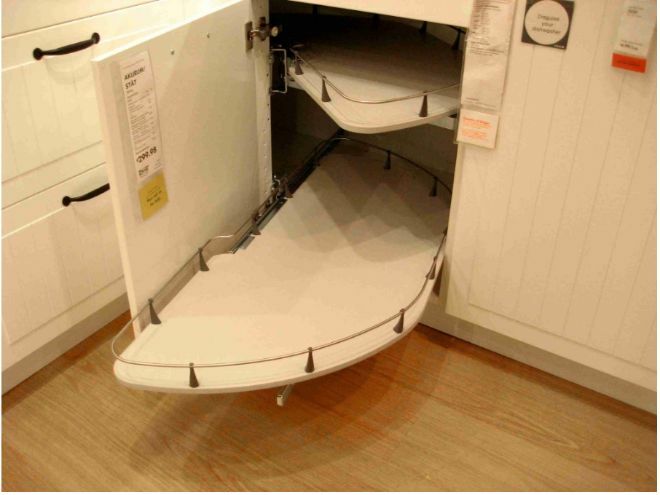 If the drawers from A Thrifty Mom aren't a workable solution for your corner cupboards, Ikea has corner cabinets for the kitchen that work off of a similar principle. The shelves swing around and back so that they fully maximize the storage potential while still being easy to access. 7. 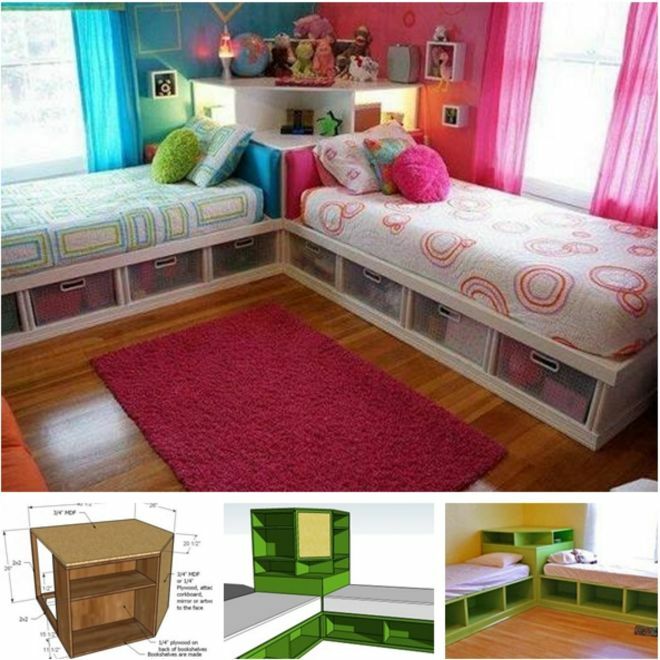 DIY space saving corner unit designed for twin beds by Wonderful DIY. The corner unit by Wonderful DIY helps keep the floor space open in a room with twin beds by maximizing the corner. The unit becomes the night stand for each bed and something of a bookshelf. Beneath each bed is extra storage so that dressers aren't needed in the room. With growing families and limited space, finding ways to use every spot you have to its fullest potential is important. You don't have to buy expensive furniture to make the most of every corner spot. Sometimes all you need is a little bit of imagination and know-how.